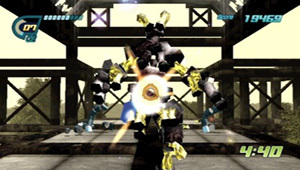 A WiiWare game that uses the Wii Zapper. You play as Mack, a recycling technician who works at Plant 530. An alien race known as the Cannoids has arrived on Earth determined to destroy the planet by taking control of the world's empty cans. Mack arms himself with the Recycle Cannon and moves through the stages automatically. You have to shoot the cans with the cannon, turning them into Can Energy that he can vacuum up and use as ammo. Mack's life is also tied to how much Can Energy he has. If he takes too many hits then it's Game Over.